The new Spartan browser, the Cortana digital assistant and even the snazzy holographic platform weren't the real high points of Microsoft's presentation. Microsoft's wide-ranging announcements today about Windows 10 covered things as mundane as new customizations for the Windows 10 Start screen and as mind-blowing as a new computing holographic platform. It showed off a new browser code-named Spartan, promised a unified development platform for all Windows devices, displayed the Cortana digital assistant running on a PC, pointed to the future of Xbox and wowed the audience with its holographic computing platform. Microsoft executives even got a chance to publicly root for the Seahawks and to subtly dis Patriot coach Bill Belichick in a news story they showed running on a Windows app. But the four most important words they uttered may have slipped right by you: Windows as a Service. You can be forgiven if they're the kind of words that make your eyes glaze over. Everyone these days seems to be promoting their products as an "as a Service" offering: Software as a Service (SaaS), Infrastructure as a Service (IaaS) or Platform as a Service (PaaS). So Windows as a Service may sound more like a marketing concept than an actual product. But Windows as a Service is real and seems to be the future of Windows, and of Microsoft's attempt to solve its struggles in mobile. Although Microsoft threw around the term several times at the announcement, it hasn't yet provided many details on what it means. But it provided some very strong hints. Terry Myerson, executive vice president of the operating systems group, said that anyone running Windows 7, Windows 8.1 or Windows Phone 8.1 will be able to upgrade for free to Windows 10 in the first year after the operating system launches. And he noted that it's not just a one-time upgrade -- Windows will continue to be upgraded for free for the life of the device. On his blog, he says, "We'll deliver new features when they're ready, not waiting for the next major release. We think of Windows as a Service -- in fact, one could reasonably think of Windows in the next couple of years as one of the largest Internet services on the planet. And just like any Internet service, the idea of asking 'What version are you on?' will cease to make sense." In doing that, Microsoft is taking a page from the success of its Office 365 subscription service, in which you pay not to download and use a single, static version of Office, but rather for an annual subscription which continually auto-updates to the newest version. Myerson seems to be saying that with Windows being delivered as a service, Windows 10 may well be the last "big-bang" version of the operating system, the last time that Windows gets a major single overhaul. Instead, it will be continually updated like any Web service -- like Gmail, for example. What's not clear yet is Microsoft's revenue model for this. Will you only need to buy Windows once and will it automatically auto-upgrade for free forever? Will you need to pay a subscription fee every year? Will you be able to buy subscriptions for multiple devices? Microsoft is playing coy at this point and not giving out any answers. Turning Windows into a service also appears to be part of Microsoft's latest attempt to gain traction in mobile. In providing Windows as a single, unified service to developers as well as users, Microsoft is combining its Windows 10 and Windows Phone 10 developer platforms into a single platform, with one Windows Store. Microsoft apparently hopes that this will ultimately lead to more apps being developed for Windows Phones. Although Windows Phone has a small user base, Windows has a massive one -- Microsoft claimed back in late 2011 that 1.25 billion Windows PCs were running worldwide. Developers who may not want to write apps for the small Windows Phone user base may well want to write for the much larger one number of traditional PCs --- and those apps could then be run on mobile devices, according to Microsoft. 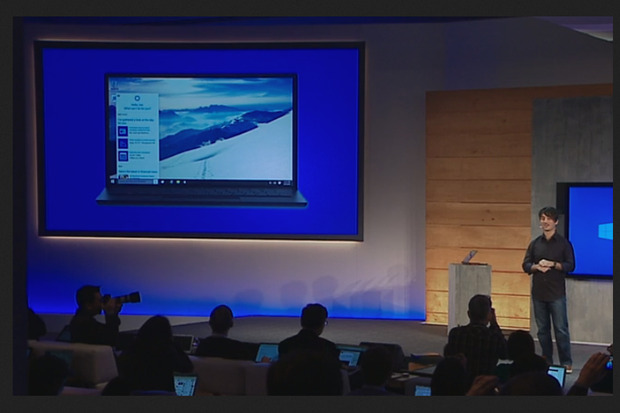 Microsoft emphasized several times during its presentation that it sees Windows as a single experience (a single service, really) across multiple devices -- that what you start on your PC you can continue to work with on a tablet and then finish it up on a phone. Files created on one device will be synched with all your other devices. Microsoft is building a number of common apps into its unified Windows platform, including apps for mail, photos and entertainment, as well as Office, which will be free for devices under eight inches. That's one more way the company hopes that providing Windows as a single service across multiple devices will spur people to buy Windows mobile hardware. Will doing all this with Windows as a Service help Microsoft accomplish what it wants? And is it something that users will want? As for mobile, it's not quite so clear. Windows Phone has only a 3% market share, according to IDC, and that share fell in the last year. Windows as a Service may be too little, too late to make up for that.